It is the descendant selector. 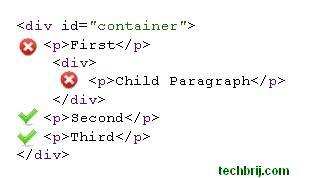 It will target all p tags within container div. It will target elements which are DIRECT children of a particular element. 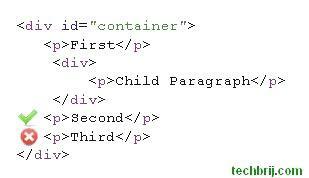 It will target all P element which are direct children of container div, not children of child div. It is Adjacent sibling combinator. It combines two sequences of simple selectors having the same parent and the second one must come IMMEDIATELY after the first. It will only select the first element that is immediately preceded by the former selector. In our example, it will target to Second ONLY because the owner P element comes just after Div tag. It is general sibling combinator and similar to Adjacent sibling combinator. the difference is that the second selector does NOT have to immediately follow the first one means It will select all elements that is preceded by the former selector. It will target both second and third. Best tutorial on internet about CSS selectors, it defines selectors in very easy way and with examples which help user to co-relate the things. Thanks man for the explanation. point to point explanation wow. Wow !! The best explanation, thank u man, you saved me.Untill now, i did not make difference between .parent .child and .parent>.child. Clear, precise and to the point. super! I guess I’m the only one still confused that did not understand the ones with the ~ or the + and what he means by preceding when it looks like they don’t precede the one selected. I will have to actually type this all up and see it for myself maybe to really get it. From what I understand they have to be on the same level. If its nested its not counted as preceding. top tip – make sure you indent your tags – this makes it much easier to see which elements precede another and which elements are nested. Yeah, I got it, man. Really well explained. Thanks man. Very clear and good read for me too. really good description with screensort…. Thanks for simplifying this. I was having a very difficult time in differentiating the adjacent child sibling declarations. You have cleared this up and really simplified the rest of the subjects in a cohesive and intelligible manner. Cheers, Kudos and a Chocolate Chip Cookie!! Very concise. To the point. Wonderful read and highly effective writing. Thank you very much for your time and best wishes to you and your blog. Great. Thanks for this blog. Excellent. Helped me a lot. for the + operator, I’d add that the elements are on the same level of nesting. Nice , did not knew about 2 and 3 before.. but used 1 in routine mostly..
is there any sign which can be used to select both child and its sub child? Not working in IE 7/8. I do not understand. Why ? Clean and simple. Good job! Really useful thanks. A lot better than needless class assigning. of the best blogger I ever saw. Looking forward for your next one.